Mike Moran is a 3rd Degree Black Belt in Enshin Karate & Original Strength Level 2 Coach. Discovering Enshin Karate led him to a path of rebuilding his body. 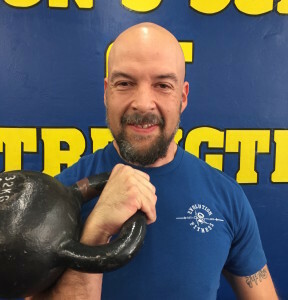 He has lost over 100lbs in the course of this journey and decided to learn everything he could how to strengthen his body using Kettlebells and Original Strength. He is focused on making himself better everyday and wants to help others to do the same. Mike runs a web forum dedicated to full contact Karate styles and you can find it at ​www.knockdownfighters.com​ . In his downtime he is with his family or enjoying a good book,film or tunes.